And we’re off and running once again with the latest policy procedure from the Transportation Security Administration, almost certainly guaranteed to accomplish nothing. 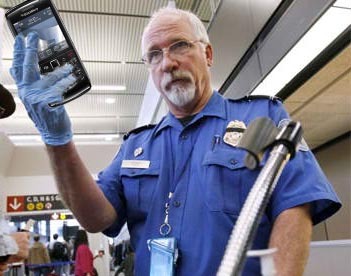 TSA has just announced that they’ll be asking random passengers who board direct overseas flights to the U.S. to power their phones on before going through security. If said device won’t turn on, passengers will not be allowed onto planes. I’m pretty sure any number of smartphone apps could accomplish the basic concealing of a diabolical high-tech bomb-triggering program. So unless TSA plans on rummaging through all of our private phone data, this move doesn’t seem to be a very promising terror-prevention tactic. Isn’t it ironic that for years, airlines have been behaving like Nazis when it comes to keeping your devices turned off…and now they desperately want to ensure that they can be turned ON? I’d write more on this topic, but I’m in an airport at the moment, and I’m worried that the device I’m writing this on might run out of batteries before I clear security. If that happens, I’ll just have to slip this tablet under the gigantic turban of the guy standing next to me. There’s no way they’re not letting him through.